This was the board that launched the Scion company back in 1978. MicroAngelo™ was an intelligent high resolution refreshed raster scan graphics display system capable of drawing character and graphics images at high speed on a standard television monitor. 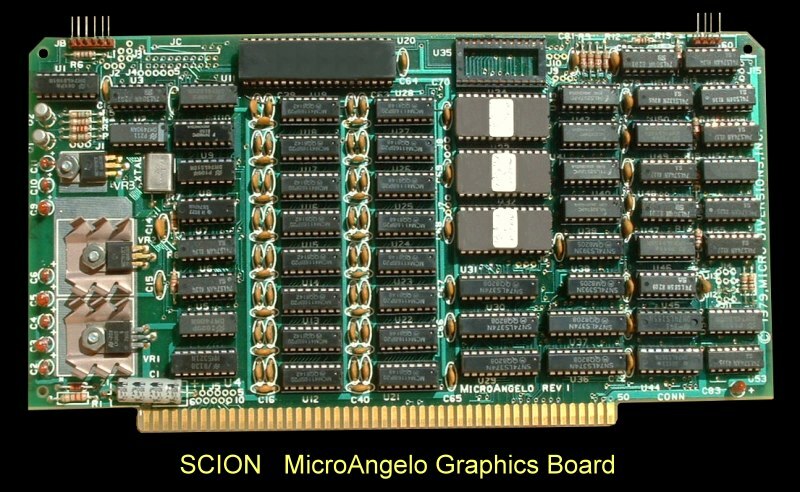 Completely contained on a single IEEE-696 card, the MicroAngelo was an independent Z80A-based computer with its own 32K byte display memory and 4K resident operating system, Screenware Pak I™, or optionally, Screenware Pak II™ [6K]. By talking in concise high level commands over a simple interface, the host computer directed the MicroAngelo in generating graphics and text displays and in controlling the light pen interface. Because of this self-reliant architecture, the MicroAngelo placed no computing load or memory space demand on the host computer. This meant that, after giving directions to MicroAngelo, the CPU could continue with its own computing as the MicroAngelo concurrently carried out those directions using its own separate memory and CPU. The results were a more responsive and convenient graphics/text display system than was possible with traditional graphics board designs. The MicroAngelo hardware resided on a single S100 bus board. This board contained all the electronics and software for generating a 512 dot wide, 480 dot high, black and white display for a high-resolution TV monitor (10 MHZ bandwidth or better). Since the board included a Z80A microprocessor, complete with its own RAM (32K bytes], EPROM [up to 8K bytes], and TV display circuitry, the MicroAngelo was actually an independent, single card computer which when inserted into the computer, appears to the system as just two parallel ports. This architecture made it possible for the computer to direct MicroAngelo via simple, powerful high-level graphics commands sent over these two parallel ports. Because of this simple and fast two-port interface, MicroAngelo was easy to integrate and did not require any of the system's valuable address space. The MicroAngelo software, Screenware Pak I or Screenware Pak II, had been designed so that the system could be used either as the main console output display, or as a separate graphics display processor, or both. Logically, the Screenware consisted of two largely independent software subsystems called ALPHA and GRAPHICS. ALPHA emulated a "dumb terminal" interface, while GRAPHICS supported all the graphics primitives. To get on the air with MicroAngelo as your main output device, you needed only implement the simple interface to ALPHA. By utilizing multiple boards (from 2 to 8) the MicroAngelos could form "bit planes" providing 4 to 256 colors. The boards were tied together using a ribbon cable attached to connector JC (unpopulated in the picture) and the local video sync chips were removed. A different board called a 'pallette' board provided synchronization for the video signal from the boards. The pallette had high speed static RAM memory to hold the lookup tables for the color values as well as three high speed digital-to-analog converters (one each for red, green, and blue). To display a graphic in a given color, the graphic primative was written to each bit plane whose bit in the desired color number was a '1'. A FORTRAN software library was provided to more easily manage a color system. The top right connector was for a light pen. The light pens sold by SCION were sensitive to infrared, so a monitor with IR phosphor was required. The top left connector provides the video signal when operated in monochrome mode. The quite detailed manual describing how to utilize this powerful board can be obtained here. When used with a MicroAngelo system, the board allowed graphics to be overlayed on the video signal. If the graphics system was color, a single key color was defined where the graphics were transparent and the video signal appeared on the monitor. MA520 -- a successor to the MicroAngelo MA512, the MA520 had twice as much video display memory. The Screenware Pak firmware supported management of two video frame buffers. It was possible to quickly switch between the buffers, so graphics could be drawn in the background and displayed after the rendering was complete. The MA520 also completely decoded the address ports in the S-100 I/O space. The MA512 only decoded the top four bits, so a 256 color system with eight boards requires 16 x 8 = 128 out of the available 256 I/O ports to be assigned! The MA520 uses two ports per board, so only 16 I/O port addresses were required.